I am so appreciative to my friend, Alex of The Children's War, WWII, who just wrote a review on a book called, "Blue," by author J. Hostetter which is written from a child's perspective about Hickory, NC, and the Polio Epidemic of 1944 during WWII. This is such an important book to me, personally, because my mother is from that immediate area and was a victim of polio at that very time. She became paralysed on her left side, spent time in a tent, then an iron lung and remembers much of the scene and times. If she weren't off on a fun trip to Arizona for the next few weeks, I could interview her about it! But for now, suffice it to say that she survived with relatively few crippling effects. She remained "small boned" and thin most of her life, has always fought a weakness on her left side mostly in her hand, and now, as she's aged she has tended to have nerve problems in her face and weakness in the muscles in her arm and fingers on the left side, as well as her left leg. These things have not kept my mother down, however! She was always and still is a Warrior Woman in spirit! I'm sure she was a little fighter as a child and that spirit brought her through a time that could have crushed another, less strong-willed child. Not to mention the fact that my family is a very long line peppered with Christians who, I'm sure, were praying the poles off the tents in Hickory! Mother is about a 16th of Cherokee, which tribe is strong in that area of North Western NC, just down the Great Smoky Mountains from Grandfather Mountain in Blowing Rock, and Boone, and, of course, what's known now as Cherokee, NC. Mother's family originates from a French bloodline. Her name is Louise, which is an old family name. It seems evident that there was some French and Indian War mixing going on in the background! I'm sure that also had something to do with her spirit and mind-set. She's not one to keep down in a battle! I'm anxious to get Mom back for an interview here later...in January. As far as I know she's only discussed her polio with me as I'm the oldest of 6 children. She never really made a big deal of it, and it certainly didn't stop her having a houseful of children! "I won’t ever forget the feeling in my legs when I lost the use of them. It was just such a weird feeling. just a surge went through my body. I can feel it right now just thinking about it. The word “polio” no longer sends ripples of fear through parents across the United States. But as early as 1916, large outbreaks of poliomyelitis, or infantile paralysis, swept through cities and towns, crippling and killing thousands. The victims were mainly children—but not always. In 1921, at the age of 39, Franklin D. Roosevelt was left with severe paralysis from the disease and spent most of his presidency in a wheelchair. During his second term, he founded the National Foundation for Infantile Paralysis, known later as the March of Dimes. Polio is an infectious viral disease that enters through the mouth or nose, then travels to the spinal cord. There it attacks nerves that control muscle activity, causing temporary or permanent paralysis. Usually polio affects leg, arm, stomach and back muscles. But if it paralyzes chest muscles needed for breathing, it can be fatal. The following year, Dr. Jonas Salk and his associates developed an injectable polio vaccine made from inactivated virus. Schoolchildren by the thousands were vaccinated, reducing the incidence of polio by almost 90 percent within two years. Later, the Salk vaccine was replaced by the Sabin oral vaccine, which was easier and less expensive to administer. Today polio has been eradicated in the United States, where the last case caused by “wild” virus was reported in 1979. Worldwide, while vaccination campaigns continue, hundreds of new cases are still reported each year. 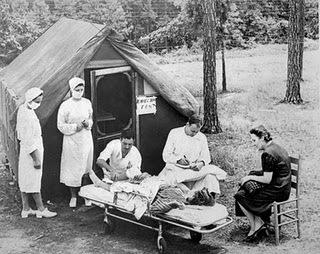 Polio swept across North Carolina’s western Piedmont region in 1944, centering around Catawba County. The March of Dimes, a fund-raising organization, was founded by FDR as the National Foundation for Infantile Paralysis in 1938. Between 1949 and 1954, 65% of those who contracted polio were children. North Carolina children wait in segregated lines for free Salk polio vaccinations. During the 1940s and ’50s, polio patients were told their muscles would lose strength and flexibility if not used to full capacity. So they pushed their bodies, often beyond their limits. 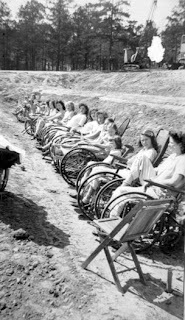 Many recovered to the point where they no longer needed crutches, braces, wheelchairs or iron lungs. But 30 to 40 years later, the disease took a second toll on some survivors. These former patients began experiencing new pain and muscle weakness, in some cases forcing them back into wheelchairs. Doctors now believe these symptoms result from overworked nerve cells, muscles and joints. 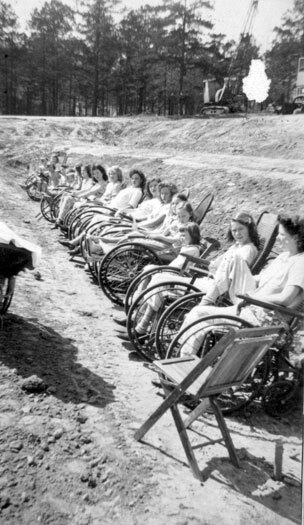 Polio killed many victims by paralyzing the muscles needed for breathing. But many more survived, thanks to a device invented in 1929, the iron lung. The patient lay on a bed that could slide in and out of a large metal tank. At one end was a motor-powered “bellows” that pumped air in and out of the chamber. As air pressure increased in the chamber, it pushed down on the patient’s chest, forcing air out of the lungs. When the pressure decreased, the chest expanded, taking air into the lungs. Some patients regained their ability to breathe on their own after a few weeks or months in an iron lung. Others remained dependent on the device for years. 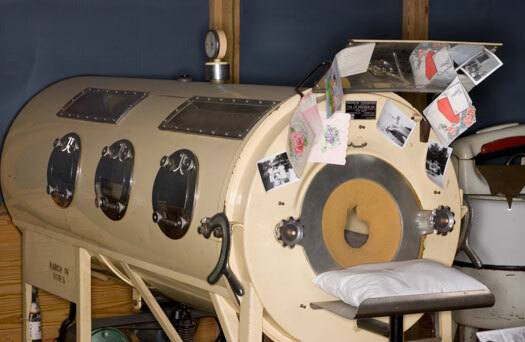 The cost of an iron lung was high—about $1,500 during the 1930s, the average price of a home at that time. 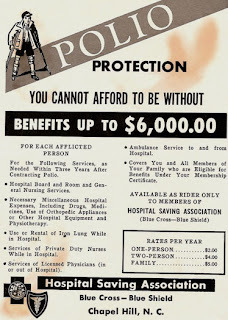 To help families afford respiratory treatment and medical equipment such as braces and crutches, North Carolina Blue Plans began offering additional coverage for polio. 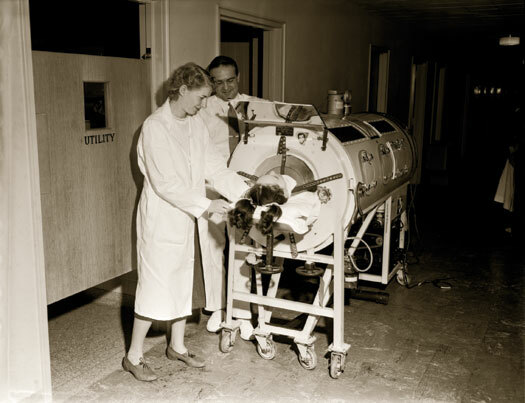 The iron lung saved many thousands of lives during the polio epidemic. An iron lung decorated with photos and cards. The mirror above the pillow let patients see visitors behind them. 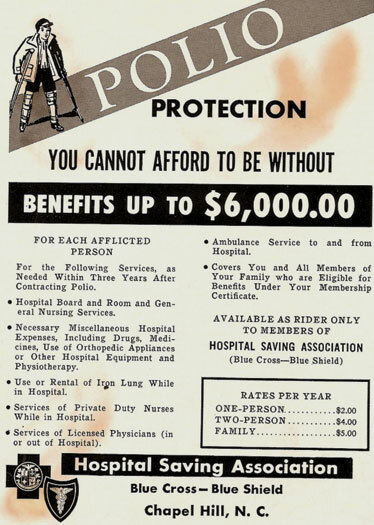 Extra healthcare coverage helped families pay the cost of polio treatment and equipment. 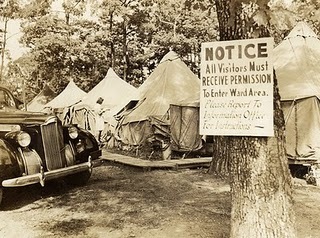 Arriving patients remained in quarantine for two weeks, isolated even from parents in case they were still contagious. Afterward, they could have visitors only on Wednesdays and Sundays. But because of distance, lack of transportation or gasoline rationing, some families found it difficult to make the trip. Spending weeks or months away from their parents made the experience doubly traumatic for many young patients, who also had to cope with the boredom of passing the long hours between physical therapy sessions, unable to move. There was no cure for polio, and theories about treatment differed. Some believed paralyzed limbs should be immobilized with plaster casts to keep them from growing crooked. But more adopted the “use it or lose it” philosophy. After the disease’s acute phase had passed, the treatment included intense, persistent exercise and heat therapy, both of which could be uncomfortable or painful. Many patients slowly regained the use of leg muscles and began to walk again with the help of crutches, leg braces and even corsets to straighten their spines. 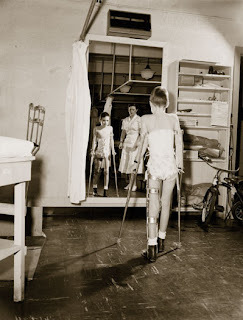 Polio victims often wore heavy braces to support weakened muscles. Because of distance, lack of transportation or gasoline rationing, some families found it difficult to visit their loved ones in quarantine. Photo courtesy of the Norfolk Public Library. I would love to hear if any of you have family who were also polio victims and/or survivors. And, if any of you are from this area of NC and remember these years....or have family who are and remember. Oh wow! I am so amazed to read your comment over at The Children's War and also your huge post on this subject as well as Crystal's comment above! I am the author of BLUE. I live in the Hickory area - would love to know more of your mother's story. Wish I could have interviewed her while writing the book. I was, however, able to interview several patients from that epidemic and that hospital. Contact me at moyergirl at charter dot net and I can help you connect with someone who has home movies of the time. Thanks for posting! 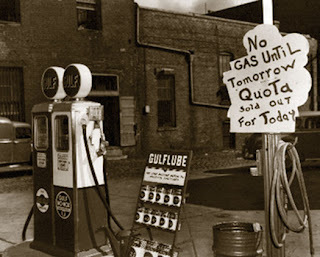 BTW - Lenoir had its own epidemic in 1953 and that is another story! Thanks for your kind mention of my blog post on Blue. I read yours and I really hope you do interview your mom, I think it would be so interesting to hear what she has to say. I know what kind of a feisty woman your mom must be, my mom has to feisty southern roots too (Baughs from Kentucky) Kudos to her for never letting the polio get the best of her life. Really interesting--thanks for sharing! I am teaching a literature circle for middle schoolers that includes Peg Kehret's book Small Steps: The Year I Got Polio, and your post came up on a search. Great stuff here! I just finished reading BLUE for the 3rd time, I loved the book and wanted to know more about polio. I have read every last book about it in my local library and still felt like I was missing something about it.